If you are sharing a database over a network, other users could be changing data while you are viewing the same data in a datasheet or form. 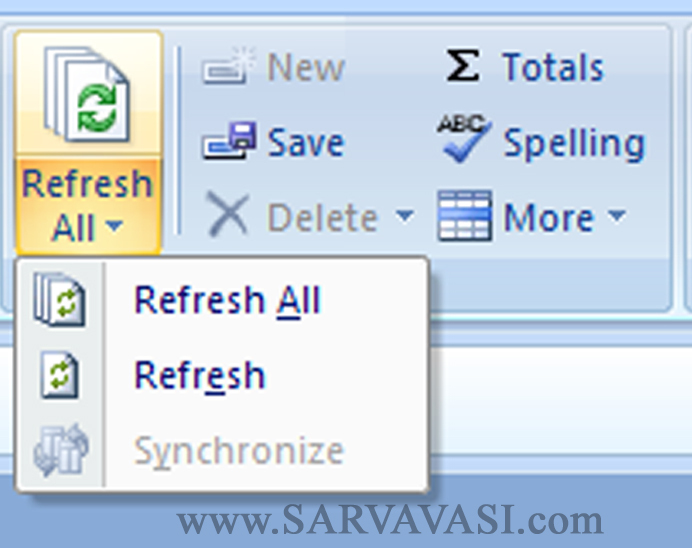 Microsoft Office Access updates the data that you see at set intervals. However, you can immediately display the most current data by refreshing the records. You can also perform a more thorough update by requerying the data. Refreshing records only updates the data that already exists in your datasheet or form. It does not reorder records, display new records, or remove deleted records and records that no longer meet specified criteria. To perform those tasks, you can requery the records. You can requery data manually, by using a macro, or by using code. NOTE: Because requerying data does more than refreshing data, it takes longer, and can take quite a while depending on the recordset. 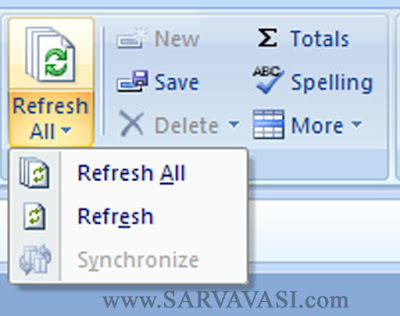 Set the refresh interval: You can set the interval at which Access refreshes data. By default, Access refreshes data every 60 seconds. Click the Microsoft Office Button Office button image, and then click Access Options. Synchronize: Data synchronization technologies are designed to synchronize a single set of data between two or more Database’s, automatically copying changes back and forth. New (Ctrl + +) : Insert the New Record. Save (Shift + Enter): To save the current Records. Delete & Delete Record : To Delete Records. Delete Column : To Delete the current column. Spelling & Grammar: To check the spelling and grammar of a document. Row Height : Change the row height. Column Width : Change the column width.